Do you think that catering companies only help with formal events? Well, you’ll be happy to know that catering services can be used at any kind of get together. The cost of catering has changed throughout the years and most businesses have been smart enough to bundle their services. This way, clients don’t have to worry about emptying their wallet. Catering exists to help you rather than rob you, which is why you should consider these four tips if you’ve been considering hiring a catering company. You’re planning a private party and have a list of things to do. Besides setting up, you would like some time to mingle with guests and catch up with friends, right? You won’t be able to do that if you’re the one preparing and serving food, making sure everyone has decent seating, and worrying about other mishaps. It comes down to whether you want to spend time taking care of everything or contacting a catering company to take away some of your worries. When you’re planning an awesome get together, you’d probably rather enjoy the work you put into it rather than get boggled down with stress. This is exactly what a catering company can grant you. Corporate events with catering services are popular for a reason. Good food during a meeting makes employees and clients feel appreciated. Even if your business is on a tight budget, you can opt for picking up the food yourself or forgoing plated service for a buffet. If catering at your next meeting sounds appealing, be sure to get a variety of quotes to compare so you can find a caterer within your budget. Wedding planning can make budgeting a nightmare. It isn’t wrong to want everything to go smoothly, but other than the bride’s dress, the food can be the largest expense. How do you have quality food without breaking bank? Although it would be nice to consider a catering service’s staff of chefs and waiters, they may not be necessary. A first-come-first-serve style buffet will make the catering service far less expensive for the big day. No matter how you look at it, a good experience with a professional catering service comes with a price. If you have an understanding of your budget and are determined to stick to it, let the caterer know. It’s similar to a business venture: get a variety of quotes, compare them, and then make your decision. Professional caterers that understand the rigidity that comes with a budget do exist and it’s important to look for them for your own sake. 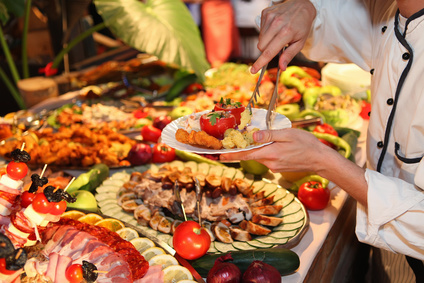 There are a variety of things to consider when looking into a catering service. Hopefully, you’ll be less worried now that you know there are options and alternatives that can help you make a good decision concerning your upcoming event. Planning something in Macomb or Oakland County? Contact David Graham Events to request a catering quote today!.